Republican presidential candidate John Kasich spoke to reporters at PJ Bernstein&apos;s Deli Restaurant in New York City on Saturday. SAVAGE, Md. — For the record, John Kasich has won just one of the 31 states that have voted in the Republican presidential primary so far. It was Ohio, where he is the sitting governor. And he hasn’t won a single delegate since. That was nearly five weeks ago. Another inconvenient fact is Kasich has fewer delegates than Marco Rubio, who recognized the futility of his own campaign and dropped out of the race last month. Kasich claims to be unburdened by these matters. He battles on — more energized than ever, it seems — motivated by what lies around the bend. He has a shot at finishing behind Donald Trump in New York on Tuesday, and then finishing behind Trump again in Pennsylvania, Maryland, Delaware, Connecticut, and Rhode Island on April 26. It has come down to this for Kasich: win by losing, or more specifically — by coming in second place. If Trump fails to secure the nomination through primary voting alone, the Ohio governor is clinging to hope that discontent with Trump and Ted Cruz at a contested Republican National Convention in Cleveland in July would leave GOP delegates with one clear choice: him. Cohen: Why is Kasich still running for president? All he’s selling is the fact that he’s not as antagonistic and bombastic as Donald Trump or Ted Cruz. He’s already outlasted candidates with more money (Jeb Bush), more potential (Rubio), and those with similar gubernatorial resumes (Scott Walker and Chris Christie). 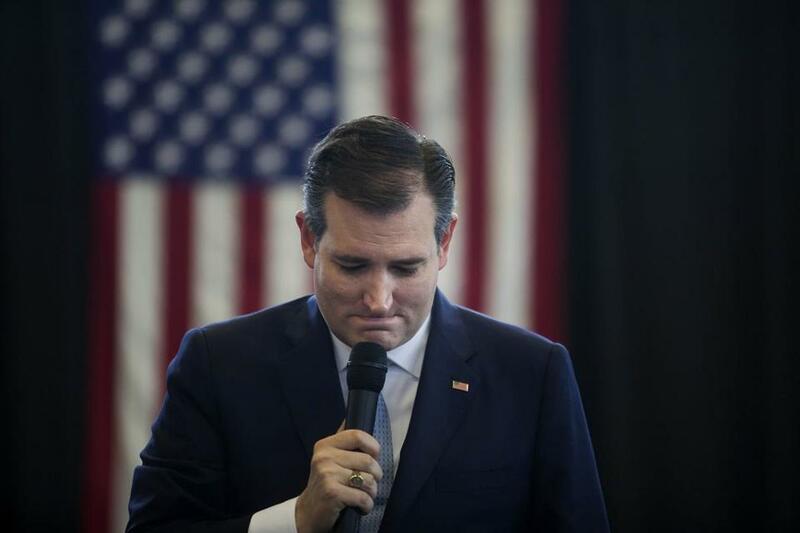 He lacks the pizzazz of Trump and the grind-it-out tactical advantages of Cruz. But securing second place in the next handful of states where Trump is expected to win — and finishing ahead of Cruz — will give Kasich added credibility and potentially boost his delegate count while keeping Trump from reaching the necessary threshold, according to his campaign. Quitting now would make no sense, said John Weaver, Kasich’s chief strategist. Kasich has been running as a mainstream Republican, an alternative to the over-the-top, outside-the-box Trump and the unpopular, archconservative Cruz. Already, his campaign notes, Kasich placed second, in an even more crowded field, in states with moderate political leanings — New Hampshire, Massachusetts, Vermont, and the District of Columbia. 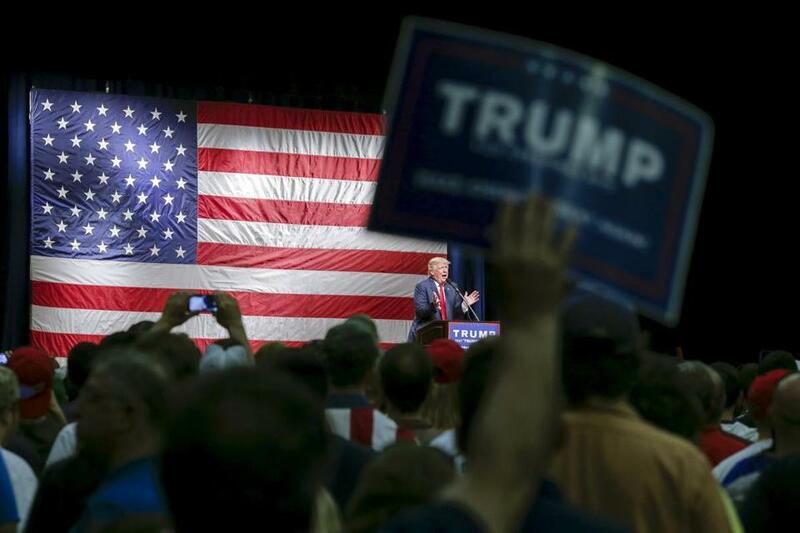 Donald Trump spoke to supporters Sunday during a campaign rally in Poughkeepsie, N.Y. 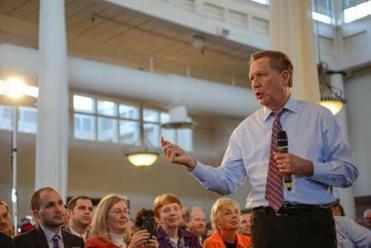 The rest of the states in April, likewise, are “Kasich territory,” his campaign said. Except it’s Trump territory, too. The real estate mogul is leading in his home state of New York by more than 40 points, with Kasich in a distant second followed closely by Cruz. Kasich stands a better shot in Maryland, where he is 10 points behind Trump, according to a recent Washington Post/University of Maryland poll. But another Maryland poll, by NBC/Marist, shows Cruz edging out Kasich for second place. So Kasich last week took a one-day break from campaigning in New York to woo voters in the Maryland suburbs. Kasich, using a spoon to eat a single scoop of chocolate ice cream from a cup, charmed the dozens who gathered at the doors of a tiny ice cream parlor in downtown Catonsville. He played peek-a-boo with a crying baby, posed for selfies, chatted with a young boy about his Little League team. “If you like the fact that I don’t name call and all that stuff, you better get out and vote for someone who doesn’t do it,” he shouted as his staff ushered him toward a waiting SUV to whisk him off to his next appearance. At a town hall held in a historic cotton mill in Savage, Kasich played the mature, mild-mannered moderate, highlighting his 18 years in Congress and his ability to compromise with Democrats. “Look, for forever, folks, I was like the guy in the minor leagues throwing a fastball 95 miles per hour, but I never got to pitch because I wouldn’t throw at the batter’s head,” Kasich told the overflow crowd of about 1,000. Kasich, in fact, is not as moderate as some voters might think. While he’s one of the few Republican governors to expand Medicaid under President Obama’s health care law and has said he supports a path for legalization for undocumented immigrants, the two-term governor has tried limiting the power of unions and enacted a series of antiabortion measures. “When put against a Ted Cruz (above) and a Donald Trump, [Kasich] certainly looks moderate,” said Mileah Kromer, a political scientist at Baltimore’s Goucher College. A contested convention will occur if none of the remaining three candidates gets to the 1,237 delegates needed to clinch the nomination on the first round of balloting. Trump has 743 delegates compared with Cruz’s 545. Kasich trails far behind at 143, having not accumulated any delegates since March 15, when he swept Ohio. Kasich’s campaign is hitting hard on the message that polls show he stands a far better shot at beating Democratic front-runner Hillary Clinton in November. A Kasich ad in New York touts him as the “one choice that will stop the Clinton political machine.” His super PAC, New Day for America, is running an ad in New York and Pennsylvania portraying Kasich as the only “stable, presidential” candidate while dismissing Cruz and Trump as “crazy,” as Patsy Cline croons softly in the background. But he does not appear to have the money he needs to sustain a significant advertising campaign. Kasich has just $1.2 million in his campaign account, while his super PAC has a balance of $2.5 million, according to the latest Federal Election Commission data. Cruz and Trump have far more at their disposal. The Kasich campaign says its fund-raising is stronger now than it’s ever been, having picked up a number of former Bush and Rubio supporters. One of them is Bobbie Kilberg, a Virginia businesswoman and longtime GOP fund-raiser who hosted a buffet for Kasich and more than 160 supporters at her home in McLean last Wednesday. Kilberg and her husband had headed Christie’s national finance committee before the New Jersey governor quit the race. They then decided to support Bush, until he dropped out, before settling on Rubio. The day after Rubio lost the Florida primary and ended his campaign, Kasich came calling.